Everyone has their own personal microbiome. It is a collection of micro-organisms — bacteria, viruses, fungi, protozoa — that inhabit your body and outnumber your human cells by 10 to 1. You may be familiar with the advice to consume probiotics in order to colonize your intestines with “good bacteria” and keep your digestion and elimination on track (a la Jamie Lee Curtis’ yogurt commercials). Studies have already shown that the health of your microbiome affects not only digestion and elimination, but is also involved with nervous system health, immunity and weight loss. The battle between “good bugs” and “bad bugs” wages on right now, as you read this. The key is understanding how your microbiome works and how you can help your microbial friends do their jobs. “Good bacteria” or probiotics keep your intestinal walls healthy. Healthy intestines allow you to optimally absorb nutrients from your food and keep destructive microbes out of your bloodstream. This is why you may hear that “immunity starts in your gut”. If destructive microbes are allowed into your bloodstream, they cause many health problems — and research continues to uncover even more connections between our health and a balanced microbiome ecosystem. A healthy microbiome is key to your health. When partially-digested food and bad bugs “leak” into your bloodstream (a condition referred to as “leaky gut”), inflammation and allergies can occur. Candidiasis is a condition resulting from the overgrowth of a fungus, which you may recognize as a “yeast infection”. (These kind of yeast infections are not limited to women. It simply refers to an overgrowth of Candida Albicans, a “bad bug” that creates havoc in the body.) 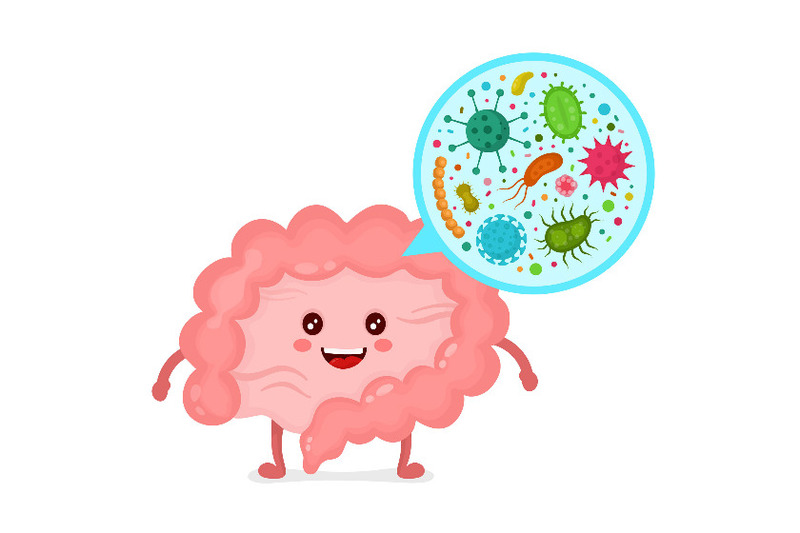 Several other common health problems associated with a “sick” microbiome include IBS, Crohn’s Disease, obesity, autism and autoimmune disorders. A very common cause of imbalance in the microbiome is extensive use of antibiotics, which kill good and bad bacteria. It’s common for people to develop a yeast infection after a course of antibiotics. An acidic body, stress and poor diet are also contributing factors. The main way to make sure the “good bugs” outnumber the bad is to eat a healthy diet, including probiotic-rich, fermented foods. Eating more vegetables and fruits that are high in alkalizing minerals (calcium, magnesium and potassium) keep your pH at the optimum level for probiotics to thrive. Americans do not typically eat many foods that contain probiotics, except yogurt; however, the sugar content of most brands defeats the purpose of this otherwise healthy food. Bad bugs like Candida Albicans thrive on sugar and the acidic environment sugar creates. Yogurts with high counts of healthy bacteria are not as palate-pleasing to most people. Kefir is a thick, yogurt-like drink with a slightly sour taste. Sauerkraut, which is fermented cabbage, is a good source of probiotics. The fresh, refrigerated brands are best. If probiotic-rich foods don’t make it to your refrigerator, you can take probiotic supplements. Current knowledge tells us to choose a supplement with multiple strains and at least 1 billion CFU (colony-forming units). Ask your health practitioner for his or her best suggestion, keeping your individual health history and needs in mind. There are formulations available made with strains known to help certain conditions, such as vaginal yeast infections, digestive issues or sinus issues. If you doubt you can make the dietary changes necessary to help bolster your microbiome, think again. It doesn’t take long to change the environment of your microbiome for the better. Studies have shown that the bacteria present in your gut can change within three or four days of changing your diet. The body is amazingly adaptive and leans toward healing. Just let your little microbial friends help you.